Official Shop — Uwe Boll. RAW. Welcome to the Uwe Boll: RAW Online Shop. Thank you for visiting the Uwe: Boll RAW Official Online Shop. your one-stop shop for official Uwe Boll merchandise through thanks again for your patronage. BUY THESE ITEMS (AND MORE) NOW BY CLICKING HERE! Bill Williamson (Brendan Fletcher) returns after living off-the-grid. Bill comes out of hiding to take over a TV station while holding a number of people hostage as a political platform. Bill sets the internet and news media on fire with his ultimate goal: to awaken humanity from complacency and bring mainstream attention to various political atrocities. 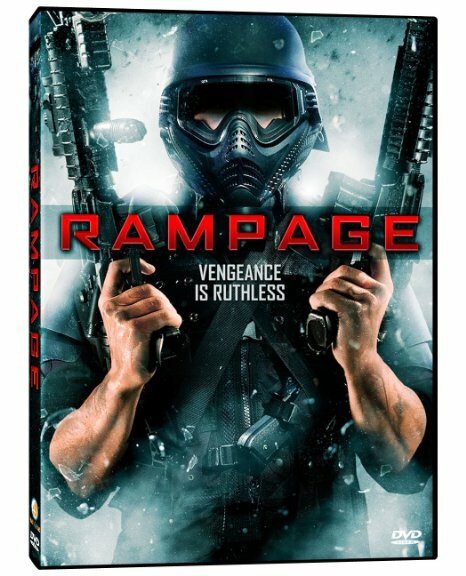 Bill is strapped and deadlier than ever in this action packed sequel to Rampage (2009). Jim (Dominic Purcell), an average New Yorker, supports his sick but loving wife after learning that she has a cancerous brain tumor. Jim is sure they can make it through when suddenly everything changes as the economy comes to a crash, causing him to lose everything amid the 2007-2008 financial crisis. Filled with deep seeded anger and unbridled rage, Jim goes forward with a plan to seek revenge upon the broken system he once trusted, for the life unceremoniously taken from him. In this zany political comedy in the spirit of Airplane! and The Naked Gun, A phony cult leader (Dave Foley) hires a jobless trailer-park denizen (Zack Ward) to help him carry out his plot to save his religious cult compound from closure. Meanwhile, Osama bin Laden and his minions plan to lace copies of a popular cartoon character with biological agents to wreak havoc on America. Based on the video game series of the same name by Running With Scissors. Be sure to check out the scene at the boxing club, where real footage of Uwe fighting his critics is incorporated into the background! The rare "funny version" Director's Cut of The House of the Dead! Based on the popular Sega video game series. A group of college students hitch a ride with a mysterious boatman (Jurgen Prochnow) to go to a rave on a mysterious island. Instead they are trapped there after the island is taken over by blood-feasting zombies. This version of the film contains alternate "comedic" takes not used in the original version, making the film very different from what you may have seen before! Dr. Uwe Boll returns to the director's chair to helm this serious-minded action film set in the war-torn region of Sudan, and following a group of American journalist as they witness the atrocities most people only read about in newspapers. Arriving in a remote village in Sudan to interview the locals about the ongoing conflict, the journalists receive word that the Janjaweed are on their way, and a massacre is about to take place. As some of the journalists flee for safety, others take it upon themselves to stand their ground and stop the Janjaweed, even if it means facing certain death. Billy Zane, Edward Furlong, and Kristanna Loken star. Based on the popular video game series, Edward Carnby is a private investigator specializing in unexplainable supernatural phenomena. His cases delve into the dark corners of the world, searching for truth in the occult remnants of ancient civilizations. Now, the greatest mystery of his past is about to become the most dangerous case he has ever faced. With the help of his ex-flame, archeologist Aline Cedrac, and his bitter rival, government agent Richard Burke, Edward is about to learn that just because you don't believe in something, that doesn't mean it can't kill you. Four early films from director Uwe Boll, in thier first time released on the home DVD market. This set features the Boll directed films German Fried Movie, The First Semester, Barschel: Murder in Geneva and Boxing as well as an array of bonus features. This set may not be available for long so be sure to buy it today! A 3-DVD set. Uwe Boll follows up his plasma-blasting 2005 hit with this sequel that finds the vengeful dhampir Rayne (Natassia Malthe) traveling deep into the Wild West for a violent showdown against vampiric American outlaw Billy the Kid (played by Zack Ward.) Includes a bonus disc featuring the full Bloodrayne video game for PC! Based on the popular video game series, A hardened seaman and a dogged reporter become trapped on an island with a mysterious scientist, a ruthless band of mercenaries, and a vicious pack of unidentifiable creatures in Uwe Boll's seventh video game-to-screen adaptation. Stranded on an island full of vicious mercenaries, the situation quickly turns chaotic when one of Dr. Kreiger's creatures escapes from the lab and sets out on a murderous rampage. One of the final films of late Twin Peaks and Stargate actor Don S. Davis. A small town misanthrope builds a bulletproof Kevlar suit and goes on a merciless killing spree in this visceral thriller from director Uwe Boll. Bill Williamson (Brendan Fletcher) is frustrated. Well into his 20's but still aimless, the only time Bill leaves his parent's house is to hang out with his best friend Evan (Shaun Sipos). But Bill's mom (Lynda Boyd) and dad (Matt Frewer) are getting tired of supporting their freeloading son, and begin turning up the pressure on him to finally find his own place to live. When Bill's boss refuses to give him a raise, something snaps deep inside. Bill is going to send a message to society, and society isn't going to like what he has to say. By the time the gunfire starts there's no turning back, and even the innocent won't be safe as Bill embarks on a grim mission to cleanse this world one bullet at a time. In this remake of the Frank Sinatra classic, A reluctant small-town war-hero gets an unlikely shot at redemption. This action/thriller stars Ray Liotta, Michael Pare, and Dominic Purcell in the main roles. Former Marine Tod Shaw saw his fair share of bloodshed on the battlefield, and to this day he remains haunted by memories of his best friend being killed in combat. Though his job on the Suddenly police force offers Shaw a chance to reconnect with the community, his crippling alcohol addiction soon takes its toll, and he is forced to turn in his badge. Later, when the locals receive word that the President will be passing through Suddenly, Shaw is placed back on duty. His resolve is put to the ultimate test, however, when three ruthless disguised as Secret Service agents take his lat friend's family hostage in their home in order to get the President in their crosshairs. Now, as the Commander in Chief draws near, Shaw must put the past behind him, and summon his inner hero for one last fight. Contains all 3 films in the action-packed fantasy film series In the Name of the King. The original film finds a man (Jason Statham) who begins a heroic quest to destroy the evil wizard Gallian (Ray Liotta) before he steals the throne. The second film stars Dolph Lundgren as a depressed man who finds his purpose to overthrow a corrupt king. The third film stars Dominic Purcell as a hit man who travels through time to ancient Bulgaria in order to destroy an ancient and powerful dictator. Join Uwe Boll in this documentary where he embarks on a redemptive quest to conquer Hollywood and take vengeance upon the film fanatics and video game nerds striving to destroy him. Filmed over three years on and off the set, 'Raging Boll' is a walk in the shoes of the man people love to hate. Features the now-infamous boxing match footage where Uwe fought his critics in the boxing ring. A must-see event! Eric Roberts is at it again in this serial killer thriller from director Uwe Boll. In an anonymous American town, a serial nutcase is taking the proverb "See no evil, hear no evil, speak no evil," a little too seriously, robbing victims of their eyes, ears, and tongues. Detectives Jim Renart (Michael Pare) and Dorothy Smith (Jennifer Rubin) are under pressure from their superior (Roberts) to capture the killer, and they finally get a break when alpha-yuppie stockbroker Tom Gerrick (Casper Van Dien) offers himself for questioning. However, actually nailing Gerrick proves to be a difficult matter, especially with the feds set to take over the case in mere hours, as well as Gerrick's impending appearance on a TV talk show. Controversial director Uwe Boll depicts the harsh reality of the process inside one of the most infamous Nazi death camps by using brutally realistic imagery. Book-ended by documentary footage as well as interviews with German teenagers about what they know about the Holocaust, Boll effectively shows us just how depraved and sadistic life in the camp could be. A heroic vampire/human hybrid with real heft takes on an army of undead Nazis in director Uwe Boll's outrageous action comedy. Blubberella (Lindsay Hollister) is a plus-sized heroine with a hatred of Hitler, and a soft spot for cotton candy. She's been fighting the forces of evil for centuries when she comes face to face with the xenophobic dictator who has plunged all of Europe straight into a hellish war. Somewhere in the midst of sending Hitler to meet his maker, however, Blubberella accidentally grants him the gift of immortality. Now, Der Führer has become a day walker with an army of undead SS officers to do his evil bidding. Destroying him won't be easy, but if there's one hero brawny enough to defeat the fiercest army ever to walk the earth it's Blubberella. In 18th century Romania, Rayne (a girl with a human mother and vampire father) possesses superhuman strength but a soft side for humans. She decides to find her vampire father who is the powerful vampire Kagan. On her journey, she is befriended by two vampire hunters and learns that there are three Talisman organs -- a heart, an eye and a rib from her ancestor vampire, Beliar -- which Kagan covets, that will make him so powerful that he will throw the earth into darkness and vampires will rule forever. Includes a bonus disc featuring the full Bloodrayne video game for PC! When Nazi Commandant Ekart Brand (Michael Paré) creates an army of fascist vampires in a plot to turn Hitler immortal, half-human/half-vampire hybrid Rayne (Natassia Malthe) assembles a fierce band of resistance fighters to prevent them from reaching Berlin and accomplishing their diabolical mission. Clint Howard and Brendan Fletcher co-star. Uwe Boll's Heart of America: Homeroom is a drama about a massacre on the final day of the school year. The last day of school contains many problems for teachers and students alike. The principal must discipline an English teacher (Michael Paré) who has let his professional frustrations get the better of him, student Dara needs to score from the drug dealing Wex (G. Michael Gray), and a foursome of cruel athletes continues to torment the losers and nerds. Unbeknownst to everyone else at the school, the eternally picked upon Daniel (Kett Turton) and Barry (Michael Belyea), as well as a third accomplice, are extensively armed and plan to unleash their fury on the school right after final bell. Inspired by actual events, director Uwe Boll's claustrophobic prison drama explores the chilling results of group psychosis. An inmate (Edward Furlong) is discovered hanged in his cell. When investigators begin interrogating the dead man's cellmates, the dehumanizing events that led to his gruesome demise gradually come into focus. Director Uwe Boll strikes hard with this deadly serious war film centering on the battlefield experiences of a U.S. combat unit sent to root out and kill Viet Cong soldiers who have been stealthily attacking American troops via an elaborate series of underground tunnels deep beneath the jungles of Vietnam.